This year’s Lytham Festival bill has been greeted with eager anticipation by Fylde tourism and business leaders. The main stage line-up for this summer was completed with the announcements of legendary DJ Pete Tong’s Ibiza Classics to feature on Thursday, July 19 and singer-songwriters George Ezra and Emeli Sande, supported by Blackpool’s Rae Morris, performing the following evening. Steps, with support from Vengaboys and Whigfield, will star on the Festival’s opening night, Wednesday, July 18 and Nile Rodgers and Chic, with Bananarama and Soul II Soul are to star on Saturday, July 21. Closing the event on Sunday, July 22 will be Il Divo with Martine McCutcheon and the Heart of England Philharmonic Orchestra. The Festival is taking place two weeks earlier than usual this year to avoid a clash with the Ricoh Women’s British Open Golf being staged at Royal Lytham and St Annes in early August. 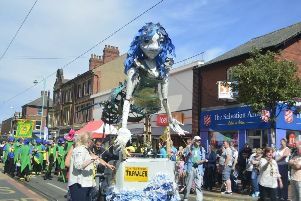 Coun Cheryl Little, chairman of Fylde Council’s tourism and leisure committee, said: “It’s going to be a really exciting summer and it’s a great bill for Lytham Festival, offering something for everybody. Denize Ashton, chairman of the Lytham Business Partnership, added: “Once again, the line-up is a brilliant smorgasbord, which on the whole has gone down very well with locals. “I think the appeal is to most age ranges and will bring new and returning visitors into the area. “Well done Cuffe and Taylor and LIveNation for bringing such great artists to our doorstep. Peter Taylor of Festival promoters Cuffe and Taylor said: “Our aim is always to make our Festival attractive to as many people as possible – whatever their music taste.